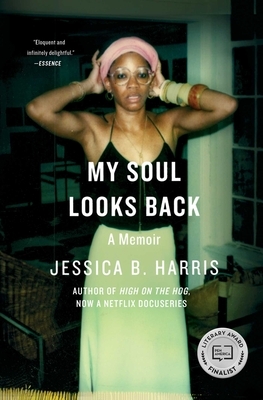 In this captivating new memoir, award-winning writer Jessica B. Harris recalls her youth “surrounded by some of the most famous creative minds of the seventies and eighties…James Baldwin, Maya Angelou, Toni Morrison, Nina Simone” (New York magazine)—in a vibrant, lost era of New York City. In the Technicolor glow of the early seventies, Jessica B. Harris debated, celebrated, and danced her way from the jazz clubs of the Manhattan’s West Side to the restaurants of Greenwich Village, living out her buoyant youth alongside the great minds of the day—luminaries like Maya Angelou, James Baldwin, and Toni Morrison. My Soul Looks Back is her tribute to that fascinating social circle and their shared commitment to activism, intellectual engagement, and each other. With “simmering warmth” (The New York Times), Harris paints evocative portraits of her illustrious friends: Baldwin as he read aloud an early draft of If Beale Street Could Talk, Angelou cooking in her California kitchen, and Morrison relaxing at Baldwin’s house in Provence. Harris describes her role as theater critic for the New York Amsterdam News and editor at then-burgeoning Essence magazine; star-studded parties in the South of France; drinks at Mikell’s, a hip West Side club; and the simple joy these extraordinary people took in each other’s company. At the center is Harris’s relationship with Sam Floyd, a fellow professor at Queens College, who introduced her to Baldwin. More than a memoir of friendship and first love, My Soul Looks Back is a carefully crafted, intimately understood homage to a bygone era and the people that made it so remarkable.